It's time again for Secret Recipe Club reveal! My secret blog assignment this month was Hun... What's for Dinner? 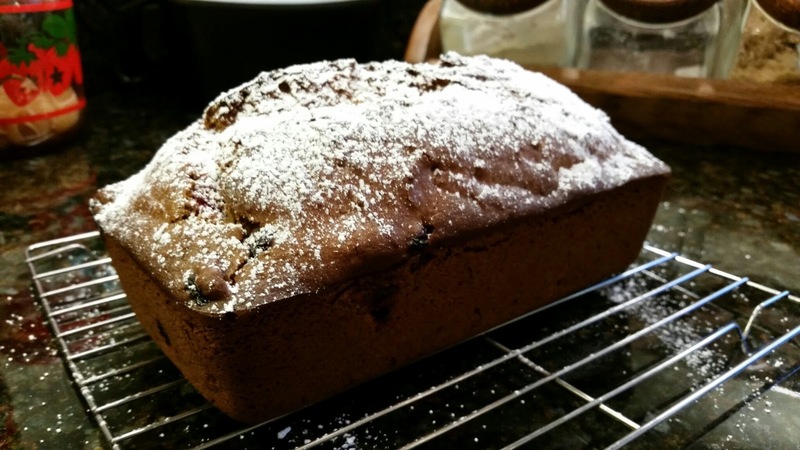 a blog full of recipes inspired by the best recipes from magazines, cookbooks and the web. Cindy is a stay-at-home mom of two adorable kids. She married a professional chef thinking he'd be the one doing the cooking in their relationship. When that didn't pan out, Cindy became an excellent cook in her own right and has even won some cooking and baking contests and been published in several cookbooks. No wonder I had such a hard time choosing a recipe from her blog! There were more, but I just had to stop myself from looking. I'm sure you know how that is. 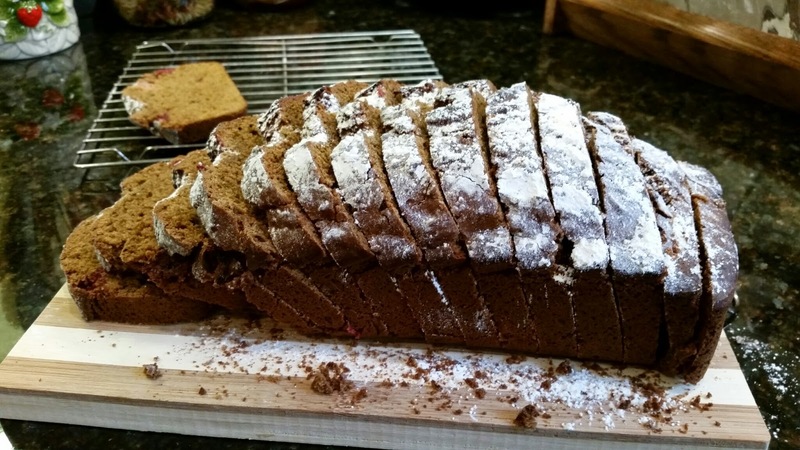 I finally decided on this Cranberry Gingerbread Loaf because I just can't resist anything with cranberries. Cindy made this for something called the Crazy Ingredient Challenge, which sounds like a lot of fun. She's also got something called Simple Supper Tuesday going on every week which is a round-up of, you guessed it, simple recipes. I will definitely have to be checking that out again! Preheat oven to 350°. Generously grease a loaf pan, or line with parchment paper (making sure there is plenty hanging over the edges). In a bowl, mix together the oil, molasses, brown sugar and boiling water. Let mixture cool to room temperature and then mix in the egg. Combine 2-1/4 cups flour, baking powder, baking soda, salt, and spices. Mix into wet ingredients until just combined. Toss the cranberries with the remaining 1/4 cup of flour and gently fold them into the batter. Pour batter into prepared loaf pan and bake for 55-60 minutes; until a toothpick inserted in the center comes out clean. Let cool 5 minutes in the pan, then remove to a wire rack. Dust with powdered sugar while still warm. Cindy's recipe called for 2 T of powdered sugar dusted on the top, but I used a little less than 1 T. After that it was just going everywhere and making a mess. It really does look pretty, but I think next time I'm going to sprinkle a little turbinado sugar on top of the loaf before baking and see how that turns out. I really loved this loaf. Is it breakfast? Bread? Dessert? A snack? I'd say all of the above! Seriously, really good - great flavor, nice texture, and the tart bites of cranberry really make it special. 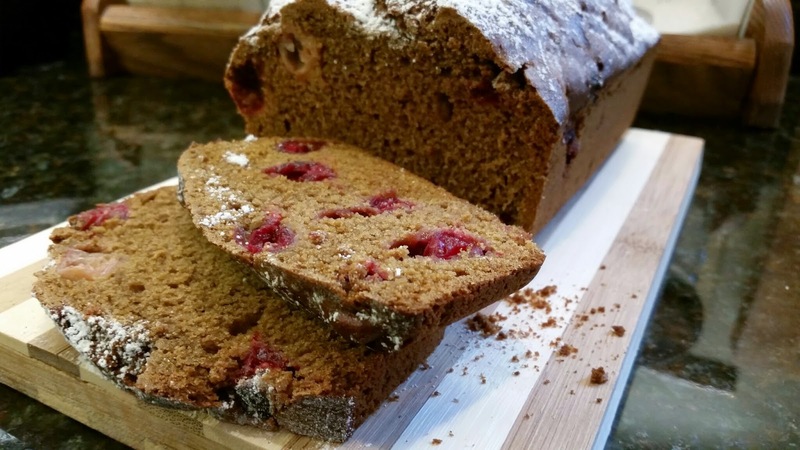 Nothing crazy about cranberries and gingerbread together. The flavors are perfect! I will definitely be making this again. My husband wasn't a huge fan of the gingerbread spices, but that just means more for me. Every time.